French Rococo Painter Famous For Fete Galante, Fetes Champetres. A masterpiece of French painting. Jean-Antoine Watteau was the finest painter of the French Rococo style, an artist beside whom the painterly talents of his contemporaries - like the Venetian Giambattista Tiepolo (1696-70), and the Frenchmen Francois Boucher (1707-70) and Jean-Honore Fragonard (1732-1806) - are measured. He was born at Valenciennes - the town had only recently been ceded to France, and during his lifetime he was considered a Flemish painter. Best remembered for his fetes-galantes, a popular form of Romanticism of the early 18th century, his major works of oil painting include: Savoyarde with Ground Hog (1707, Hermitage, St Petersburg), The Holy Family on the Flight into Egypt (1715, Hermitage, St Petersburg), Pilgrimage to Cythera (1717, Louvre), The Italian Comedy (1718, SMPK, Berlin), Gilles (Pierrot) (1719, Louvre) and The Hunting Party (1720, Wallace Collection, London). He first learned the basics of drawing and painting from the artist Jacques-Albert Gerin, in Valenciennes. In about 1702, Watteau went to Paris as an assistant to either Gerin or another local artist, a painter of scenery for the Paris Opera. 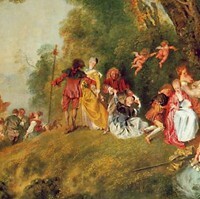 This was probably Watteau's first contact with the theatre. He later became infatuated with it. Left in Paris by his master, Watteau was forced to produce copies of popular Old Masters on a semi-production-line basis. It may have been at this time that he began to paint in his own right, scenes he would have known during his childhood at Valenciennes, executed in the style of the Dutch Realists Adriaen Brouwer (1605-38) and David Teniers (1610-90). Throughout his life his paintings were always based on drawings, and even during these early years in Paris when he was living in poverty, he made many delicate drawings after nature. Quite soon after his arrival in Paris he had the good fortune to come into contact with Claude Gillot (1673-1722), the theatrical painter, daughtsman and etcher, and by 1703 he may have been his pupil. Under Gillot he renewed his association with the theatre and in particular with the Commedia dell'Arte. This troupe of Italian comedians had taken Paris by storm with their fast and irreverent pantomimes; their performances had been considered so scandalous that the company had been expelled from the city in 1697. The memory of the Commedia dell'Arte lived on in the productions of French comedians who also based their plays round the traditional characters of Harlequin, Pierrot, and Pantalone. Scenes from the Commedia formed most of the subject matter of Gillot's paintings, handled in a rather matter-of-fact way. Not surprisingly, the paintings that Watteau made during his apprenticeship with Gillot are Commedia scenes that seem, like his master's, to have been painted from actual performances. It was Claude Gillot who ended Watteau's apprenticeship about 1707 or 1708, possibly because of professional jealousy. He transferred his apprenticeship to Claude Audran III (1658-1734), one of the leading decorative painters of the day and whose studio employed a number of artists to carry out his designs. Under Audran, Watteau absorbed a complete Rococo vocabulary of trellisses, birds and monkeys, and chinoiserie (Chinese motifs). Despite these changes, Watteau was lucky to have studied under Gillot and Audran, both of whom were modern artists outside the main stream of French academic painting, for by inclination as well as by birth Watteau was an outsider in the Parisian art world. Audran was the curator of the Luxembourg Palace, and through him Watteau had regular access to The Life of Marie de Medici cycle of paintings by Peter Paul Rubens (1577-1640). He was able to study and to copy unhindered a series of paintings by his great compatriot. Rubens' technical ability, his draftsmanship, and his handling of paint were far superior to any painting being produced in Paris at that time, and the Marie de Medici cycle became the most important influence in the development of Watteau's style. In 1709, Watteau submitted a painting for the coveted Prix de Rome competition, whose prize-winners were awarded a 5-year scholarship to study fine art in Rome. He came second, and his fortunes began to improve. Sirois, a dealer with whom he later stayed, commissioned him to paint a contemporary battle scene. Watteau returned to Valenciennes, close to the battle lines of the Duke of Marlborough's campaigns, to make his work as natural as possible. Few of his paintings of military scenes survive, but engravings show that what interested Watteau was not the fight or the glamour of battle but the underlying reality: the camps, the soldiers waiting for orders, and the general inactivity of war. His military paintings are like reports from a modern war correspondent, for he had an acute eye which could select the important in everyday life. This perceptiveness was Watteau's greatest gift, and he used it fully in the type of fine art painting with which his name is most closely linked, the fete galante (fetes champetres). In this type of picture, beautifully dressed young people idle away their leisure time in a dreamy, romantic pastoral setting. This type of scene of lovers in a parkland setting stemmed originally from Giorgione (1477-1510) and the medieval "Garden of Love", but Watteau was the first rococo painter to breathe real life into the idiom, an idiom later revisited by Francois Boucher and also by Jean-Honore Fragonard in his famous work of love and seduction The Swing (Fragonard) (1767). It was as a painter of fetes galantes that Watteau was enrolled at the Academy; a new category was specially created for him. The painting he chose to submit for membership was entitled The Pilgrimage to Cythera (1717, Louvre, Paris). The painting has its origins in a scene from a contemporary play, Les Trois Cousines. It shows the return of a group of people from Cythera, the island of love, at the moment they realize that the pleasures of love are transitory, and that it is time for them to leave their enchanted island for the boat to the mainland. Note: Watteau was an important influence on the great French lithographer and poster designer Jules Cheret (1836-1932). It was Rubens who once again was the inspiration for Watteau: not so much the Rubens of the Marie de Medici cycle, but the Rubens who painted "The Garden of Love" (c.1634, Prado Museum, Madrid). Seriousness of subject is not generally thought to be an attribute of Rococo painting, and Watteau's exquisitely dressed and perfectly mannered courtiers may seem at first sight as unlikely as his Harlequins and Pierrots to be the vehicles of human passions. But Watteau was above all an artist who understood the theatre, with its contrasting layers of artifice and reality. For the extraordinary renaissance of applied arts in France during the Baroque and Rococo eras, please see: French Decorative Art. For furnishings, see: French Furniture. For artists and craftsmen, see: French Designers. Restlessness, ill health, and financial motives may have encouraged Watteau's visit to London in 1719. It was probably during his year in England that he created "La Toilette" (1719, Wallace Collection, London). Realistic and freely painted, it shows a Venetian sensuousness quite new to French Painting. At Watteau's death, only a year after his return to Paris from London, his priest persuaded him to destroy a number of "offensive" paintings that were probably similar to La Toilette. It was just before his death that Watteau painted the large Giles (1719, Louvre, Paris) as a theatre placard for a theatrical troupe. "Giles" was the French adaptation of Pierrot, the scapegoat and outcast derided by his companions. In Watteau's painting he stands isolated and vulnerable, with his stupid face and ill fitting clothes. Watteau may have felt an affinity with Giles for he, too, was an outsider, set apart from his contemporaries by temperament as well as by talent. Works by Jean-Antoine Watteau can be seen in many of the best art museums throughout the world.